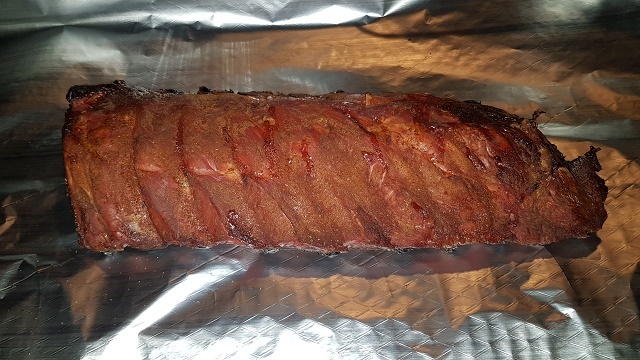 As per the comments made by Jor, I have taken a photo of todays ribs. Where the smoking process has been stopped after 4 hours. ... the smoke caused it to be a lot darker looking than normal cooking. How did they taste after that long time in the smoker? The "smoke" flavour must have been very intense, I guess? Uhhh... that looks tasty. Now a short round on the grill while they are still warm - have the sauce ready to apply and some cooled drinks in the fridge. Not to forget some nice bread. Well... 2018 will be the year. Not a great difference, as it is said, after 4 hours the meat does not take anymore taste. It has gone as far in to the meat as it can. So all you are doing is making the outside darker, by more smoke on the outsdie. NEW YEAR, NEW START, NEW TOY!!!!!! So not much to report, but lets get to show off the new toy I have ordered for my smoker!!! So it converts my wood smoker to a wood fired pizza oven! I will have to wait until it get here, I have done pizzas already, they were nice tasting, but had to cook for too long. Reports and update inc, when it gets here. First problem, I have to remove all the thermal stuff, bit annoying but a 10 minute job. Would rather leave it on, so I can swap back to smoker mode easier. Also this fine british weather has decided to snow today. It was suposed to be about 8c, but currently 1 and snow. This very cold damp air will not help, but I should be used to that. So I will run it later, throw a few shop bought cheap pizzas on and see how it goes. If they cook OK will show a photo, if bad will just throw them away. 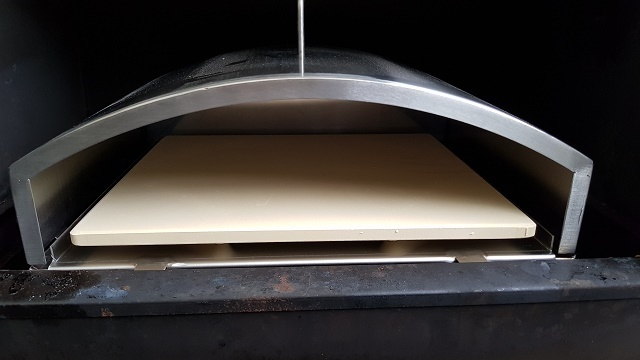 Never cooked pizza at 400c so I am sure I will get it wrong. Well there was issues, simple reason it was too cold to do it. Could not keep the stone temperature up when the lid was opened. But the pizza stuff cooked nice and quick, so does work. I don't want to spoil your fun, but it looks very shallow to me. Now I know those flat pizza-ovens but I have always been a big fan of stone ovens for Pizza. To my mind the dome like structure is the key. Nothing for your average garden etc. - I know. I am very interested in your results - especially when you make the step towards self made pizza! I agree, but it is an adapter to the smoker, rather than an actual pizza oven. If I was to build, one, it woudl look like that. Plus the actual fire is below this unit, where the smokers firebox is, so does not need that extra space to burn wood. I just need to wait for warmer weather and see how it goes. I an also use it for searing steaks, bread oven etc, so for a simple addition opens up a lot of possibilities. Oh a better photo, where you can see the glow of the fire below. OK, so this really shows I need to clean the smoker too. Quick update, did another shop pizza again, a little warmer (8c) outside and dry. Stone heated up much better and kept a bit more heat. So deffinatly will be really good in the summer. So I have a good dough recipe now that works. So getting better with those. Still need the practice, but there is only so many pizzas you can eat while testing. My cousin gave me a pizza oven, well when I got to see it, it was not. But I have located a place that does good clay for them. 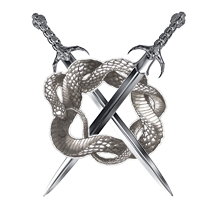 So I am a little closer to getting all the bits to make my own. Did a brisket today (well last night) and some pulled pork. 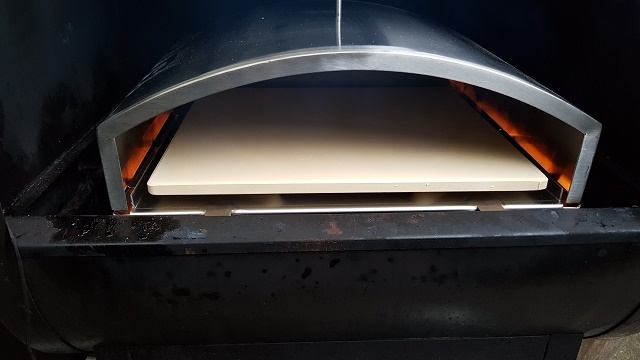 By mistake (after chaning from pizza stone) there was a bit missed out, so it did more direct heat than smoke. Even though the food was cooked well, the smoke ring was less than normal. So it was interesting to see this result, but the beef still tastes great. Made a new batch of my BBQ sauce and I am happy to say, I can replicate it now very well. We have a new way of sealing the bottles, so it will last for at least 2 years on the shelf. Update over, hope to give more details over the next few weeks. Sounds great! What's the special dough recipe I wonder! We've bought a house, which will be build next year, so I have some time to ponder what kind of 'device' I want in the garden. The ability to do pizza's there sounds appealing! Nothing special about it, it is a Jamie Oliver one. Just worked better for me than other ones I have tried. Others I tried were more sticky or did not roll out very well. 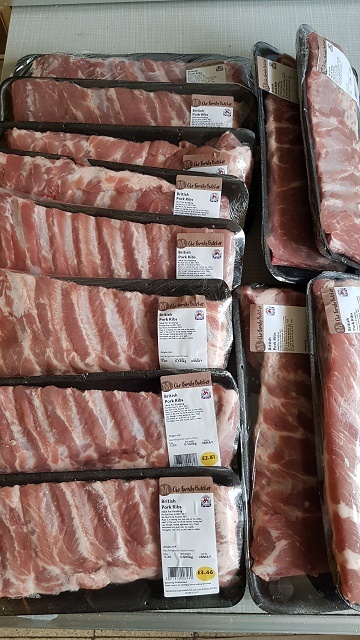 Well, it is going to be a nice day tomorrow, so thought I would do a couple of ribs in the sun. Just to prove I still cook. Actually, 7 of these have been sold (they are giving me cash for doing it) by friends. Good way to get a practice in, without spending too much cash. I just do a basic dough with flour, a few drops of olive oil, salt and some luke warm water. Often even not going for any yeast. Quick and tasty! The ribs already look nice!